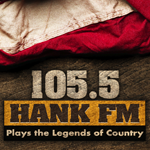 Are you interested in advertising on The Legends of Country 105.5 Hank FM? We're excited for the opportunity to work with you & your business. To get into contact with us, please use the form on this page & we'll be contact with you as soon as possible.